OVERALL, the Super Rugby season has been a positive one for Aussie rugby. And so it was last weekend. In fact, it was double-triple, super-dooper, Super Rugby. Last week's Wallaby logistics camp in Sydney appears to have galvanised and inspired the minds of all those in attendance. And if last weekend's footy is the result, I for one am calling for a Wallaby logistics camp every month. Last weekend's quality couldn't come at a better time. Australian rugby needs this year to be overwhelmingly positive. Not only is it struggling for relevancy in the world's most competitive sporting market, but with the British and Irish Lions (BILs) hitting our shores in a little more than six weeks, we need some momentum. The Tah v Chiefs and Saturday's Reds v Brumbies games were belters. The Tahs' win will give them much needed confidence as they travel to the Republic for games against the Bulls and the Kings. The Reds v Brumbies game started with the Brumbies playing field position and pressuring for points (their approach is the exception in Aussie rugby at the moment), and the Reds having a red-hot crack, searching for the five points at every opportunity. The Reds twice, around the twelfth, and thirteenth minutes, turned down easy shots at goal to go for the five pointer. And they delivered. The Brumbies either got caught in the moment, or could smell what the Reds were cooking, and became expansionists by chance rather than design. Best example was Jesse Mogg's (without a doubt a Wallaby in waiting) running from his own 22 in the twenty-second minute of the game, and ending in a five pointer three minutes later. The weekend's footy augurs well for the upcoming British and Irish Lions' Tests. And what's pleasing is that positive coaching approaches (for the most part) are being backed up by some impressive individual performances. Will Genia and Quade Cooper are getting close to the top of their games individually and as a combo. Others such as Kane Douglas, Dave Dennis, Liam Gill, Michael Hooper, George Smith, Israel Folau, Jesse Mogg and Digby Ioane are all playing good footy. 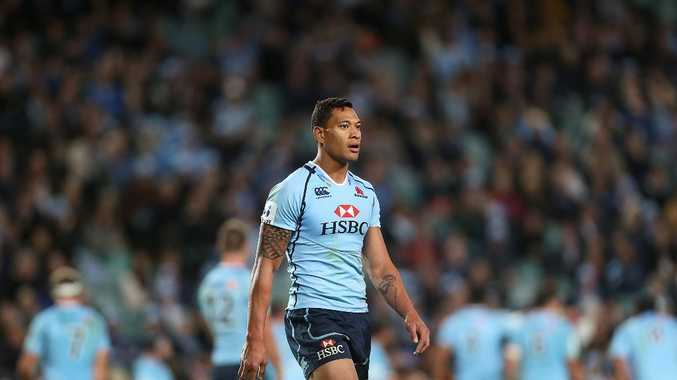 One player who is really improving is Israel Folau. The bloke is special. Look, I don't think he's ready for the Lions, but if he keeps improving, a spot on the end of year Wallaby trip to Europe is warranted. But who knows, he could be that bit of special talent the Wallabies need against the tourists. Anyhow, let's hope Robbie Deans gets caught in the moment and becomes an expansionist, too. As the saying goes, rugby was the winner last weekend. And never has it been truer, or more in need. Will Quade Cooper leave rugby and try his hand at league?